Animal foods are bad for you. Humans aren’t designed to eat meat. It isn’t natural for humans to eat meat. Your ancestors hundreds of thousands of years ago didn’t eat meat. Eating meat is a just a bad habit picked up my modern humans. If we all stopped eating meat, we’d all be healthier. Plant foods are bad for you. Humans aren’t designed to eat plants. It isn’t natural for humans to eat plants. Your ancestors hundreds of thousands of years ago didn’t eat plants. Eating plants is a just a bad habit picked up my modern humans. If we all stopped eating plants, we’d all be healthier. That’s what I call reverse-vegan thinking. I’ve written about it before, but decided to tackle the subject again because the video of Pete Evans cooking for us drew the ire of some reverse vegans online. That dang ol’ Pete ruined a perfectly good pan of eggs by adding harmful squash and kale. Humans shouldn’t be eating those harmful plant foods. I’ve seen similar videos, and it doesn’t surprise me that many of the people making them are ex-vegans. I’ve mentioned Eric Hoffer’s terrific little book The True Believer in other posts. It was written in the 1950s but is still relevant today, as is much of what Hoffer wrote. Hoffer explains that people with the true-believer personality type are attracted to extreme positions. They’re aren’t comfortable with ambiguity (such as some plant foods are good for you and some aren’t.) And surprisingly (or perhaps not) they’ll sometimes jump from one all-or-nothing belief system to another, even when the belief systems are polar opposites. The switch often happens like this: some intolerable event or situation or outcome finally pierces the true believer’s resistance to evidence that the belief system is wrong – or simply isn’t 100% correct. At that point, the true believer’s all-or-nothing personality causes him to flip from fully embracing the belief system to fully rejecting it. What was 100% correct and good in the past is now 100% wrong and possibly evil. Vegans believe eating animal foods is morally wrong, and also harmful to our health. Some of them develop nasty health problems as the result of the vegan diet. I’ve known vegans who absolutely, positively refuse to believe their bad health is the result of shunning all animal foods. That simply CAN’T be true. So they write it off as bad luck, genetics, whatever. If paleo humans didn’t eat plants, I wonder where the term hunter-gatherer came from. I recently had someone on Facebook insist that most Native Americans didn’t plants at all. 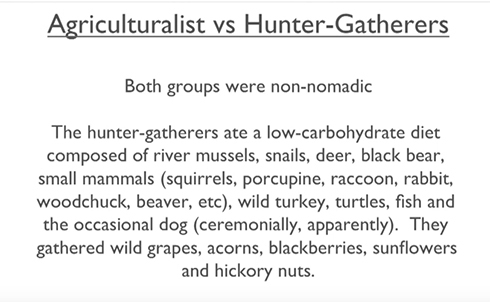 That slide lists what Native Americans from a tribe in Kentucky ate. Were they hunters who ate a lot of meat? You betcha. But they also ate grapes, acorns, blackberries, sunflowers and hickory nuts. This was no surprise to me, because I read a ton of books on Native Americans as a kid, and I know damned good and well most of them ate both plants and animals. When Europeans arrived, the Native Americans had already developed new varieties of corn, beans, and squashes and had an abundant supply of nutritious food. Maize (corn), beans and squash. That combination is known as The Three Sisters. The natives taught the Pilgrims how to grow that combination. Pretty strange lesson coming from people who (according to some internet experts) didn’t eat plants all. Here we report direct evidence for Neanderthal consumption of a variety of plant foods, in the form of phytoliths and starch grains recovered from dental calculus of Neanderthal skeletons from Shanidar Cave, Iraq, and Spy Cave, Belgium. Some of the plants are typical of recent modern human diets, including date palms (Phoenix spp. ), legumes, and grass seeds (Triticeae), whereas others are known to be edible but are not heavily used today. Anyone who insists paleo humans didn’t eat plant foods is engaging willful ignorance. The overwhelming evidence says they did. The few paleo peoples who subsisted on all-animal diets were the exception, not the rule. Of course, that fact that paleo humans ate plants doesn’t automatically negate the belief that plants foods are bad for us. Most of the don’t-eat-plants arguments I see online center around the toxins in plants. Beans contain lectins, ya see, so we shouldn’t eat them, etc. When I read those arguments, I’m reminded of a speech I saw Matt Lalonde give at the Ancestral Health Symposium in 2011. In case you’re not familiar with him, Lalonde has a Ph.D. in organic chemistry and does research at Harvard. He’s spent rather a lot of time studying the paleo diet and the nutrients in foods. He’s a fan of the paleo diet. But he’s definitely not a fan of weak science. In his AHS speech, he said something along the lines of, If you walk into a room full of organic chemists and say people shouldn’t eat legumes because they contain lectins and lectins are bad for you, they’re going to look at like you’re an idiot and won’t listen to anything else you have to say. That perked up my ears, because at the time I was telling people I don’t eat legumes because they contain lectins and lectins are bad for you. Not wanting organic chemists (or anyone else) to look at me like I’m an idiot, I paid attention to the rest of the speech. Lalonde went on to explain that an organic chemist would ask a whole series of questions: Are the lectins neutralized by pre-cooking processes such as soaking? Are they destroyed by heat during cooking? Are they neutralized during the digestive process? Do they actually get into the bloodstream or pass on through? In the case of most legumes, he said, the lectins are destroyed by cooking. Eat them raw or undercooked, yes, they’re harmful. Cook them properly, they’re harmless. The gluten protein in wheat and other grains, however, isn’t destroyed or neutralized by processing and cooking. So whether or not we can safely eat a plant depends on what it does to us once we cook it and ingest it, not the list of supposed toxins it contains. Lectins are a type of protein that can bind to cell membranes. Studies have shown that lectins can impair growth, damage the lining of the small intestine, destroy skeletal muscle, and interfere with the function of the pancreas. Sounds serious, right? Not so fast. There are several reasons that these results cannot be extrapolated to humans. First, the animals consumed very large amounts of lectins—much larger than a human would get from a varied diet which includes legumes. Second, the lectins were from raw legumes. Why is this significant? Because humans eat primarily cooked legumes, and cooking neutralizes the lectins found in most legumes. In fact, cooking legumes for as little as 15 minutes or pressure-cooking them for 7.5 minutes almost completely inactivates the lectins they contain, leaving no residual lectin activity in properly cooked legumes. Phytic acid interferes with enzymes we need to digest our food, including pepsin, which is needed for the breakdown of proteins in the stomach, and amylase, which is required for the breakdown of starch. Phytic acid also inhibits the enzyme trypsin, which is needed for protein digestion in the small intestine. Sounds pretty bad, right? While it is true that diets high in phytic acid contribute to mineral deficiencies, it’s also true that humans can tolerate moderate amounts of it without harm (perhaps because our gut bacteria produce enzymes that break down phytate and extract the nutrients the body needs). In fact, there’s even evidence that phytic acid may have some beneficial effects. It prevents the formation of free radicals (making it an antioxidant), prevents the accumulation of heavy metals in the body, and plays a role in cellular communication. So yes, plants contain anti-nutrients. But humans figured out how to neutralize or destroy many of those anti-nutrients a long, long time ago. Adding cooked plants to a meal doesn’t automatically make it toxic. That’s why I now eat the refried beans with my fajitas when we go out for a Mexican dinner. That’s why I’ll eat pasta made with lentil flour now and then. My diet is still mostly animal foods, but I’m not afraid to eat plants. If you believe you’re healthier on an all meat-diet, great. If it’s working for you, by all means, continue. But please don’t try to tell me ancient humans didn’t eat plants, or that all plants are dangerous, or that all humans would be healthier on a diet devoid of plants. There’s simply no reason we’d all be biologically geared to be at our best on a diet our ancestors didn’t eat. I’m trying a Carnivore Diet for a 6 month period, not because of the plants-are-harmful mantra, but because I believe my weight gain on LCHF over the last 10 years is because I am just not eating enough, and I can consume more calories with fatty meats and eggs without busting a gut to see if that is the case. Then, I plan to incorporate some plants back into the diet , as per Dr. Blake Donaldson in “Bad Medicine” to see what works for me and what doesn’t. I’ve tried lowering carbs, upping fat, Upping carbs, lowering fat to no avail and I feel lousy. I want to see what the Carnivore fuss is about. I know people that are thriving on it, and people who said it didn’t do a thing for them. Let us know how it works for you. I don’t feel at my best on a zero-carb diet, which of course is what a pure carnivore is. But some people seem to do very well on them. Will do. The one program that I think matches me the most is Jonathon Bailor’s SANE Nutrition. I liked “The Calorie Myth” above everything else I have read. However, I do like a few things he suggests ditching like sweet potatoes, peas, etc. I’d like to follow Dr. Paul Jaminet but I think the protein is too low and I am not sold on safe starches. I think SANE is a fine option for many people. Again, I don’t think there’s a diet that’s right for everyone. Timely post. I’ve been noticing the carnivore/anti-plant movement in the past few months. Maybe the vegans never heard of the phrase, “for every action, there’s a reaction.” Now we have crazies on both sides. Good job, guys. Crazies on both sides? So people who find a way of eating that is healthier for them are now crazies. The carnivore trend is nothing more than people finding out that those low carb fruits and veggies are enough to de-rail their progress. Those nagging health issues that went away for some low carbers and keto folks but not for them. The n+1 stories are out there for all to read. Carnivore was just the end point of their elimination diet. But between sustainability between a carnivore and a vegan diet I have my money on the carnivore. And the carnivore has the added benefit of being able to eat the vegan if push comes to shove. To be clear, I’m not saying people who eat all-meat diets are crazy. I’m saying people who take that experience as evidence that all-meat diets are the correct diet for everyone are drifting into true-believer territory. Simply put, there’s no such thing as 1 diet for all. Not right now, at least. Also, I’m not sure of many scientists that can argue for the “sustainability” of carnivore. I was a vegan once. I understand that many in the Paleo, LCHF, Primal etcetera communities have been Vegan at some point. I can’t remember why or when I quit. I know why I quit being a vegetarian (I was never vegan). My health was going downhill. Me, too. Just had a discussion with my chiropractor’s office manager. Says she eats a plant based diet, but occasionally eats chicken, some seafood, a steak once in a while, although she knows “it’s not good for me” and eschews dairy because that stuff’ll kill you. Meanwhile, she has stents in her heart, has had three heart attacks and swears by “What the Health”, “Forks Over Knives” but doubts the manager of a local Vitamin Shoppe who worked on an “organic farm” who revealed that in order to get certified “organic” the farmer simply needs to pay a fee for the privilege. Told her how sick I got as a vegetarian as a teen. She all but said, “were you doing the diet right?”, then said we’ll agree to disagree. Oh, and she belongs to Weight Watchers. Tells them they’re wrong about everything but stays for the support. That’s always the refrain when you tell a zealot his or her diet didn’t work for you: “You weren’t doing it right.” Yeah, that’s one possibility. The other is that people are different and there’s no diet that works for everyone. This is my theory as to why I think so many folks who were having health issues prior to going Carnivore are now doing much better on a Carnivore diet. Most, if not all, had a leaky gut. The toxins/bacteria over the years had eaten away at their gut lining thus providing an opening for whatever further toxins they ingested to enter the body’s system where it didn’t belong and thus provoking the immune system into overdrive. By eating nothing but meat, which contains a lot of glutamine, the gut had a chance to heal itself and thus folks felt much better on the Carnivore diet. I was also wondering if people who can’t eat plants at all are dealing with a damaged digestive system. Couldn’t be any worse than the chiropractor on You Tube who is built like Jabba the Hut with a gluteus maximus that’d make the Kardashians envious, pushing a vegan diet and suggesting that we all need to poop at LEAST three times a day. The only people that need to be hugging a commode that much are people with tremendous hangovers. Around here camas root was a major part of the Indian’s diet – & that in spite of having plenty of salmon. Camas is a lot of trouble to dig up & process, but the Indians thought it was worth the work. Every once in a while I amaze myself when I think of the much greater variety of vegetables I eat now than I did growing up & as an adult on a high carb diet. That’s one of the reasons I don’t buy the theory that humans only started eating plants when there was a meat shortage. Many of the tribes that ate squash and beans lived in areas described as “a hunter’s paradise” by early explorers. And as I’ve mentioned before, the western Sioux visited their eastern cousins and traded buffalo meat for squash. That means they wanted the squash. Yes. The one thing I learned from being vegetarian (and briefly vegan) was how to cook all kinds of vegetables. Now I eat a vegan diet along with my meat, poultry, game and fish. That works. My father used to call me a “fussy eater” because I didn’t like a few of the things he did, but actually he had a very limited palate by comparison to what I eat now. I have a suspicion that “gatherer-hunter” mat be a more accurate description of our past. The women and children gathered vegetation, eggs, fish, small mammals, insects etc. while the men said they were going off to hunt but actually sat around boasting and farting and eventually dragging back some roadkill. Yeah I’m exaggerating . . . but just how much? They probably ate grains and seeds too, but seasonally, not for three meals and three snacks a day. IMO the biggest gains in my health came from ditching the starches as well as the sugars, and especially wheat. This leaves more room for nutrition, both animal and vegetable. The carnivores are interesting but I wouldn’t want to go all the way there unless I had to. Are you also thinking of the book Plant Paradox? That book is getting some traction from True Believers. No, I haven’t seen it. I’m going by what I see online. I’d love to hear your take on The Plant Paradox if you get around to reading it. I’m reading it now and, I don’t know, so far I find the writing annoying because the author spends more time talking about himself and his qualifications than anything else. I’m having trouble getting to the real “meat” of the book. Haven’t seen it. I may get to it. I’ve been trying to move to a more traditional Scottish diet since my family is of Scots-Irish decent. As far as I can tell, the only real carb they ate was oats, so until I find out otherwise, that is all I will have once I get away from the temptations of working in a doughnut shop. I’m mostly Irish myself, so I did some digging on diets in ancient Ireland awhile back. Definitely heavy on meat, plus fish in coastal areas. They also ate berries, chestnuts, and hazelnuts in season, if I remember correctly. Grains like oats and barley were of course later additions. I forgot about the barley. I love hazelnuts and berries, so that’s great to hear. I’ve had people who won’t believe me that the Scottish ate so little in carbs and yet healed crazy fast. They sound almost like the ancient heroes of Greece! And this was only about 100 or so years ago. I translate nowadays articles about nutrition and diet science for Russian-speaking blogosphere. While traslating, I came across several articles about some people who HAD to follow a meat-based diet. They are Mikhaila Peterson, who suffered from a very serious autoimmune condition http://foodmed.net/2018/05/mikhaila-peterson-poster-girl-carnivore/, Andrew Scarborough with a brain cancer https://zerocarbzen.com/2015/05/31/healing-brain-cancer-with-a-zero-carb-ketogenic-diet-by-andrew-scarborough/, Amber O’Hearn, http://www.empiri.ca/p/eat-meat-not-too-little-mostly-fat.html who manages her by-polar disorder. Also, one of paleo- protocols https://www.researchgate.net/publication/323151200_Therapeutic_protocol_of_Paleomedicina_Hungary?tab=overview is very well researched recommends only fat and meat at the beginning . Personally, I am not interested in a meat-only diet, but I keep in mind the possibility of such regiment if my health nosedived. Sure, it’s a diet that works for some people. My problem is with those who insist a meat-only diet is the best option for everyone. Hey, nice on leaving the true beleiving stuff behind. Which btw I think you have for years. Tubers (including potatoes) and beans ive long considered as safe. Infact my gotos when I would switch from keto to zero fat weekends. Found ditching either macro very effective for controlling satiety. When you say most of my food comes from animals, what do you exactly mean? When I was doing keto I would have 6 to 7 serves of non starchy vegetables a day. A few serves of high fat dairy, and high fat animal products. Enough to maintain a calorie defecit. Aside from stuff like peanut butter, olive oil and avacado a bulk of my calories came from animal products. In terms of serves and bio mass my diet was mainly plants. In terms of calories mainly animal products. Im curious do you see any health issues with stuffing your face with 7 serves of non starchy salads and vegetables a day? Do you refrain from eating a lot of plant material? Or is more like me. By calories its mainly animals? By calories, my diet is mostly animal foods. Breakfast is eggs and some kind of meat. On weekends, I may add a small potato or piece or gluten-free toast. If I eat lunch, it’s usually some kind of meat, perhaps with some broccoli or another green vegetable. Dinner is where I’ll add in squash or a sweet potato or some pasta made from lentil flour. I’d say whether nor not there are issues with stuffing your face with salads and vegetables depends on what they are and how you react them. I’m not against vegetables, just kale. I don’t like it. My problem is sugar. Use more butter on the kale. Use grass fed butter or ghee, of course. Use coconut oil. It makes it slide out of the pan into the garbage real easy. Never seen the attraction of kale . . . but then I do like my Brussels sprouts, and broccoli. Animals defend themselves with teeth and claws, or by running away. Plants defend themselves with toxins. Over evolutionary time most of us have evolved to detoxify most of them, and even use them as drugs. Not everyone though. I do significantly worse with wheat than any other starch – far from uncommon. Seed oils are probably bad for most everyone but given the current push from dieticians, and Jane Brody, we are being forced to adapt, or die. Eugenics. I enjoyed the second article. Reminds me of a piece I read waaay back during the scare over Alar in apples. A biochemist wrote an essay describing all the “poisons” in the plate of food he’d eaten for dinner. Then he explained how every one of them had been neutralized by cooking or the digestive process itself. Are you familiar with Georgia Ede’s work? Personally, I have a huge problem eating plants from the Nightshade family. If I happen to eat a Nightshade plant my joints will seriously let me know about it! Why? 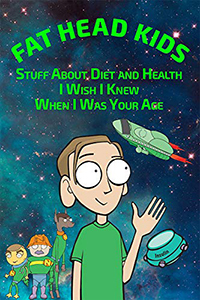 I’ve read hundreds of anecdotes of folks who had serious issues with IBS, Crohn’s, Diverticulitis, and many other ailments who after totally eliminating plants from their diet they were for all intents and purposes… healed. Why? It’s back to the principle that everyone is different and what works for one person might not work for another. I can eat walnuts, but a handful of them would send Chareva’s mother to hospital if not the morgue. Good point. But, it makes me wonder sometimes if time is a factor in when one starts to feel the effects of ingesting something whether it’s drinking alcohol, smoking, taking drugs/medication, or even eating something like plants. We know vegetarians/vegans are fine when they start out eating mostly/only veggies, but eventually it catches up to them. Perhaps the same thing applies to those who start out eating grains, legumes, and plants. They’re fine eating those foods for years until it eventually it catches up to them. For some it takes longer than others to start feeling the effects. I don’t think we can blame all of one’s ills on just sugar, seed oils, processed foods and bad genetics. My advice to those who are suffering from digestive or autoimmune issue would be: Eliminate all plants/fruits for a month and gauge how you feel. If you feel a lot better… then it’s mostly likely the cause. They would also be wise to also try eliminating dairy and grains. Paul Jaminet makes the point that people jump from one extreme diet to another and feel good for awhile after each switch. He believes the reason is often that we switch to a diet that provides something missing in the previous diet. I suppose it could also be that we were overloading on something in the previous diet. His point is that we need nutrients at a certain level. If we’re short on a nutrient, we’re not healthy. If we overload on a nutrient, at some point it becomes toxic. And of course if we have an allergy to a particular food, we shouldn’t be eating it at all. Oh, brother. Some vegetables are bad because you can’t eat them raw, and some are poisonous? Does the author of the video know that raw meat can contain critters that can make you extremely ill, or that the liver of a carnivore will give you hypervitaminosis A? She’s a childish, annoying ideologue. Yup, I wouldn’t eat raw chicken either. But that doesn’t mean chicken is toxic. BTW, I tried eating more “seasonally” last winter–meaning, fewer vegetables and more meat. I gained weight and felt lousy. Toxic berries and lectin-laced lettuce made me feel better. I’m one who failed on carnivore. Eating pure meat causes me to dehydrate more than other people. The result is eyes so dry they scratch themselves when I blink and other symptoms like that. I tried it for an entire month. I drank TONS of water. My bladder would fill in 10-30 minutes, even over night. I learned how to keep my eyes shut and find my way to the bathroom to pee. Opening my eyes would scratch them. At the end of the month I dropped my cognitive dissonance and stopped. It doesn’t happen with eggs but it happens with meats, even fish or shellfish. If I eat eggs, I’ll drink a normal amount of water that day. If I eat meat, my water intake doubles easily. Now I mostly eat eggs/veg with a little meat. You’re describing one of the symptoms that convinced Paul Jaminet not everyone does well on a zero-carb diet. Some people stop producing enough tears and saliva. Some have gut-health issues because the mucous layer in the intestines is partly made of glucose. Some people (more women than men, from what I’ve read) experience hormonal disruptions. I am of course a big fan of low-carb diets. I’m still on a low-carb diet myself. But I want people to realize that just because low is beneficial, it doesn’t mean lower is even more beneficial. That’s just not true for many people. I asked about the frequent urination on Carnivore. I was told by a few carnivores that the frequent urination is temporary and eases up after a while. They also noticed their fluid intake decreased, too. Yes most things in nature are U curves or J curves. Only drugs are linear. Fruits in Africa are huge. Honeyguide evolved to guide humans to honeybee hives. There was indication through isotope ratios in bones that humans had a lot of food through grasses, which could have happened through eating herbivores, but it was realized later that it could be grass based tubers like tiger nuts. In the wild fat is the most difficult macronutrient to obtain, even more so than protein. Animals are lean and very few plants store a lot of fat in their bodies. So whatever humans ate could not be low carb. Meat was also not very easy to get as hunts didn’t always succeed. Actually lots of tribes in Africa have a special word for hunger of meat. Which could only have come about if there were times when they could not get enough meat. The result of the above is that humans evolved on a higher carb diet, possibly including lots of sugar, at least during seasons (honey or fruits). Meat was important but not a frequent part of the diet. This also means that whatever it is in the present times that is causing humans to become obese and losing ability to handle sugar, has nothing to do with consumption of sugar/carbs. It is something else. Possibly refinement. Mostly likely pesticides, and other toxins in the environment. I wouldn’t conclude that sugar doesn’t make humans fat. Early humans weren’t able to gorge on fructose all year long. Actually they would have got it in sufficiently high quantities, in between honey and fruits, when they got them. Not everyday even in season, but when they got them, the quantity would be very high. But these are not refined sugars of the present times. Whole foods generally behave much better in our bodies than refined foods. And would you agree that the diet was high carb and not low carb and definitely never high fat, except in the very rare cases. I’d say it depends on the geographic location. Isotope analysis shows that humans were top-level hunters and ate a lot of meat. Unlike most of us modern humans, they also ate the brains and marrow and other fatty bits. As for high-carb … I don’t see how my paleo ancestors in Ireland could have gathered a high-carb diet. Loren Cordain puts the carb content of paleo diets at 15-30%, depending on the region. I personally have found benefits eating fewer plant matter. Certainly many plants make me feel bad (nightshades, peppers, etc.). I have not yet gone full carnivore, but I’m close. I do eat quite a bit of offal, though. I love beef liver and beef heart for instance. My local farm is having a sale on meats, and I’m going to stock up on liver, heart, tongue. I also eat a wide variety of meat, such as shrimp, mussels, pork, chicken, lamb, etc. Want to try brain, but have not done so. N=1 studies are tough, though. I bought a continuous glucose monitor to test whether higher protein caused my blood sugar to go up. I could not find that it did, even eating 150+ grams of protein in a single meal. Eating too much protein does not make me feel good though, so I’ve been keeping it lower. I also thought that ketones decreased in response to eating more protein, but I’m now testing more often, and I don’t know what happens with more protein, though ketones don’t see to be hurt much if at all. I tried probiotics and prebiotics for 5-6 months (eg, potato starch, plantain flour — caused an allergic reaction, plaintains, many different fermented foods, different probiotics, including soil-based etc.). Could not find a benefit, only detriments. If there is a benefit (other than I get to eat yoghurt), I can’t tell there is one. I’m giving it one last amount of yoghurt, though. I think it’s all person-based. 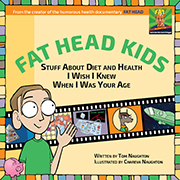 I’ve been listening to the Keto Hacking MD podcast, and Jimmy Moore had hypoglycemia while eating a 90% fat diet. I didn’t know that was possible, but it was for him. For me, I’ll likely continue to eat as I do until I feel I need to shake things up. Basically, that’s lunch without plants and dinner with a few, cooked or fermented. I’ll also eat them out, as getting enough to eat when eating very low carb is tough enough when eating out. I don’t think people on carnivore diets are crazy. If it works, go for it. My issue is with the ones who complain that Pete Evans ruined those eggs by adding plants because all plants are toxic, blah-blah-blah. Tom, it’s cool how you aren’t afraid to tweak your eating habits based on new information you get. We should all be so flexible and willing to evolve. I love legumes but I know the carb content can present a problem for me if I go overboard. But when my son was very little I’d soak red lentils then cook them for him with bone broth and butter. I thought that was a very nutritious thing to give a little one. The carb content is still a problem for me as well if I go overboard. But I’ve found a 2-oz. serving of lentil pasta (with lots of meat and an alfredo sauce) doesn’t raise my blood sugar much. I like green split peas (with bacon). My problem is not so much the carbs, more the gas content. I’m listening to Undoctored (Dr. William Davis) at the moment. The current chapter is describing how the USDA has given it’s blessing / approval to GMOs, and the likely problems those have on human consumption. I’m only part way through the chapter so don’t yet know how much detail is in there. I wonder if part of the problem people have when eating plants are due to the modification and associated pesticides, even when prepared and cooked appropriately. I’m not sure it’s the same in the US, but here in Canada there is no obligation / law to enforce the labelling of GMO foods. In Ireland and Europe where I grew up, it is a requirement and consequently you rarely see fresh GMO foods sold. Coffee comes from a plant, so they’re OK by me. Davis made the point in “Wheat Belly” that part of the problem with modern wheat (as opposed to the stuff 100 years ago) is that it’s been modified into something our bodies don’t recognize. Yes it’s not just GMO but “normal” plant breeding techniques. Someone I know who collects vintage farm machinery reckons some of the early combines (1950s – 60s) will no longer work in modern wheat, they can’t be driven slow enough to cope with the huge yield of grains and relative lack of straw. Other grain crops, not so much.